At the end of 2012, Andrew Wong took over his parents’ restaurant – having occupied the same site on Wilton Street, near Victoria station, since the 1980s – and re-launched as A. Wong. Having previously worked in the kitchen, the chef had become well-versed in dim sum, a facet of the restaurant’s lunch menu that has since garnered a devoted fan base of food obsessives, eventually earning a Michelin star in 2017. I was late to the party, having enjoyed my first lunch at A. Wong in the spring of 2016, but have returned on countless occasions over the past two years, lured by the carrot-shaped dumplings filled with rabbit; the siu long bao rampant with ginger; the salted duck egg custard buns – still my favourite dessert in London. Since setting the world on fire with an innovative, playful take on contemporary Chinese food, Andrew Wong has intended to open a second restaurant for quite some time: finally opening Kym’s in October. Amongst good company (Bleeker, Brigadiers, Caravan, et al) in the shiny new Bloomberg Arcade opposite Cannon Street station, Kym’s is named after the chef’s Grandmother (also A. Wong’s original name) and has a refined casual dining approach. 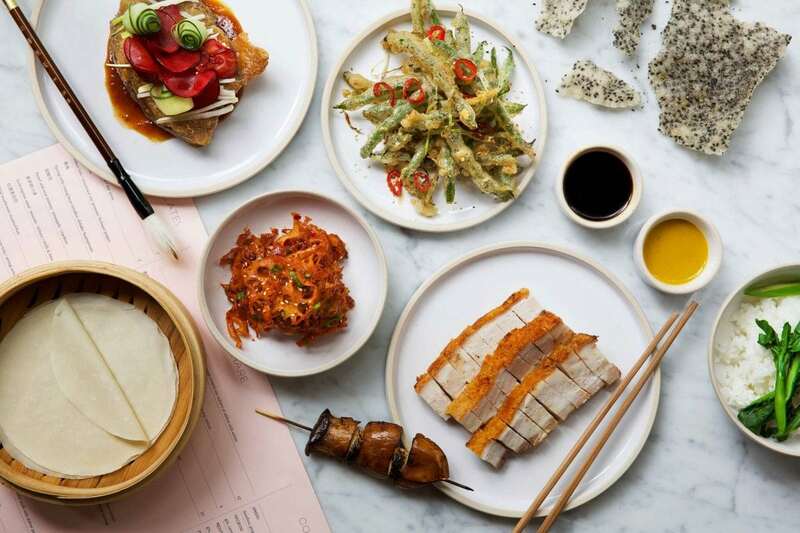 Gone are most of the dim sum relishes, replaced with a vast menu rooted in refined versions of Chinese classics, carrying a particular focus on Cantonese roasted meats. 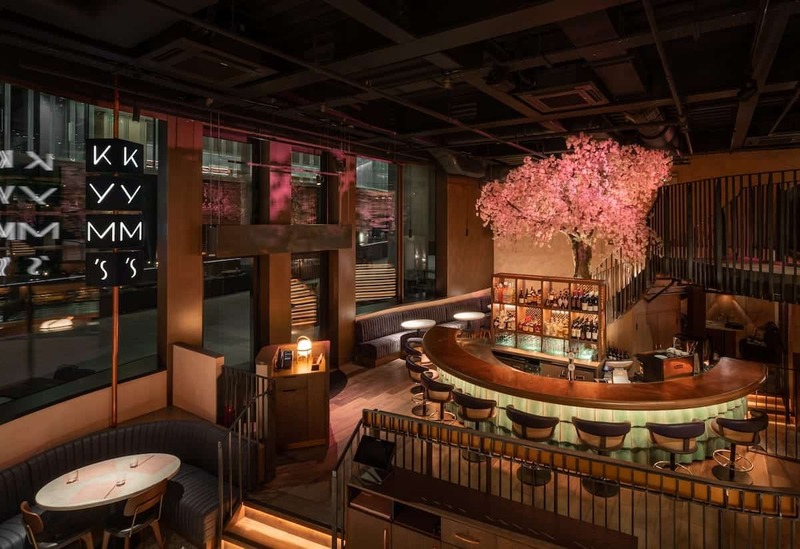 As for the space, Kym’s occupies a huge site over two floors, placated by an artificial cherry blossom tree. Elsewhere, subtle Chinese inflections are met with lavish dark woods and terrazzo flooring, plus a colour scheme of ‘millennial’ pink and rich plum tones. An open kitchen stretches across the back of the room, embellished with hanging roasted meats, separated from the main dining room by a bar with front row seats. For the restaurant launch, Head Chef Jimi Tegerdine has been flown in from LeVeL 33 in Singapore, here serving a menu split into small plates, skewers, sharing plates, classics, fritters and sides. Struggling to settle on a reasonable amount of food for two people, intent on eating everything, our waiter helpfully suggests a range of the new restaurant’s greatest hits. Lunch begins with a brittle, unusually fresh rice cracker crowned with shredded spinach (£3). The cracker is fine, but it’s the accompanying 1908 ketchup that really excited: sweet, salty, umami, ambrosial – I’d buy bottles by the crate if possible. A humble dish of silken tofu with garlic soy (£8) is one of the most compelling dishes eaten. Diced tofu is presumably wok fried with lashings of soy sauce and garlic, finished with 100-year-old egg – contemporarily preserved in ash and clay. The egg white accompanies minuscule cubes of soy jelly and thinly sliced spring onion, while the yolk is used to enrich the sauce. Crispy shallots add additional depth of texture to the finely tuned dish: proof that tofu needn’t be tedious or merely reserved for the dietary restricted. Sichuanese aubergine (£7) is another triumph, cooked to the point of submission, acquiring an innate sweetness to contrast the ferocious hum of Sichuan pepper. Mushroom steamed bao (£6) is the sole dim sum dish to have made it from A Wong to Kym’s. Dusted with cocoa powder, the buns are designed to visually resemble chestnut mushrooms, with the pillowy dough harbouring a filling of intense wild mushroom. Pork and shrimp ‘bao bao’ (£12), on the other hand, is served in a cast iron skillet, featuring steamed and fried gyoza amongst a delicious mess of fried eggs, crispy chilli and black rice vinegar. 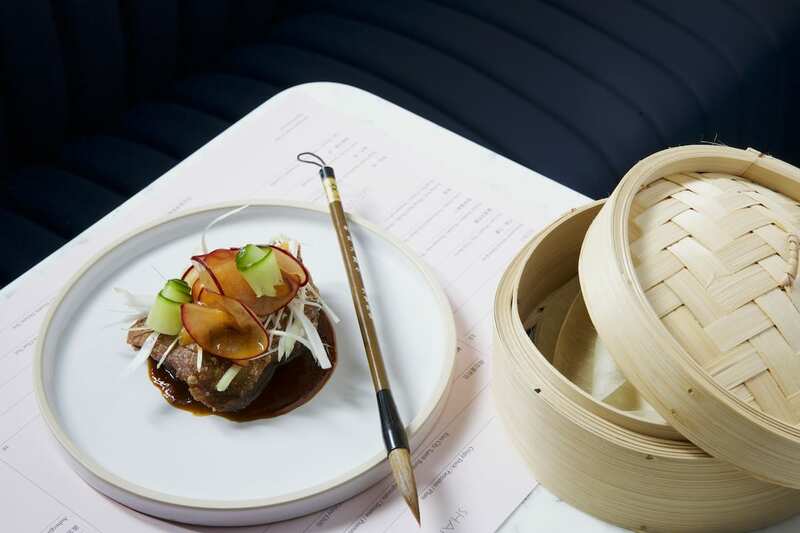 The superlative crispy duck (£18) served at Kym’s is another fresh take on a classic, presented with paper thin pancakes and intended to be shredded at the table, joined by mandolined plum slices and a thick plum sauce to be applied with a convoying paintbrush. An early favourite, now touted as a signature dish, ‘three treasure’ (£20) provides a small taste of three Cantonese roasted meats. Chicken poached in soy sauce has creamy flesh and bronzed skin, rampant with salt, ginger, star anise and rock sugar; char siu favours Iberico pork, renowned for its fat, served pink and lashed with honey; while the pork belly is the produce of 48 hours’ hard work. Salted, cured, air-dried, then finished in a furnace oven at 370 degrees Celsius, the pork belly is an absolute triumph. Dessert, however – a Chinatown pineapple bun (£6) – is dense, unbecomingly vast (stodgy even) and piped with molten vanilla custard. Plentiful for two to share, the pineapple bun is fine, yet forgettable in keeping with the splendour of everything else eaten. Rather than serving as A. Wong 2.0, Kym’s has its own unique personality. While my beloved dim sum is far less prominent on the lunch menu, the cooking here is executed just as considered and eminently dexterous – rendering one of the year’s most anticipated restaurant openings well worth the wait. Kym’s can be found at 19 Bloomberg Arcade, London, EC4N 8AR.